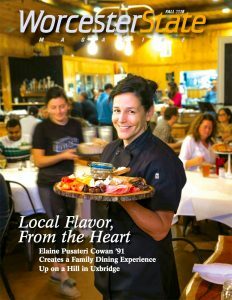 Click here for articles and recipes by Elaine Pusateri Cowan, owner and chef de cuisine for Foodies of New England Magazine. The church pews didn’t feel at all out of place as we walked into The UXLocale in Uxbridge. It may not have been Sunday (we visited on a Friday night), but it was clear that a trip to “The UX” constituted a weekly ritual for countless members in the community. The dining room and the bar were both at capacity, and a few brave souls had even taken up residence on the patio under the heat lamps. Our server greeted us with a basket of freshly baked bread and red sauce. She introduced herself and walked us through the menu, explaining UXLocale’s commitment to local and sustainable sourcing. During every interaction, she struck me as intelligent, calm and polished, despite the demands of her section, which was clearly at capacity. The pizzas were stunning in both taste and presentation. The result of UXLocale’s woodfire oven was a light, airy crust that had been slightly scorched and hung daintily over the edge of the pan. The “funghi” had been topped with shredded gruyere, thinly-sliced apples, rosemary-infused portobella mushrooms and caramelized onions – a divine combination of sweet and salty to balance our taste buds. The “down with gpp” embraced gorgonzola, pear and prosciutto, with a faint nod to fresh thyme. The UXLocale has a serious aptitude for unconventional placement of fruit on pizza. On our way out, I spotted a tray of microgreens growing beside the large pizza hearth, confirming my notion that the ingredients on my plate had been properly tended to. As The UXLocale’s popularity continues to grow, it is my expectation that their precision and attention to detail remain consistent. Put an extra loaf in the oven, the dinner rush is on its way. As the sun sets over the hills in rural central Massachusetts, the brilliant rays of light and panoramic views of fields that seem to have no end point reflect endless possibilities for Elaine Cowan at her new restaurant, The UXLocale in Uxbridge, Mass. Positioned at the top of a hill and as a restaurant that goes beyond satisfying diners who love locally-sourced food and drink, The UXLocale offers the dining-out dream-come-true combination of delicious fare, a rustic and welcoming atmosphere, an owner, family and staff as genuine and welcoming as the beautiful countryside, and incredible scenic views from the seasonal outdoor patio. Cowan has created a restaurant perfectly compatible with her sincere, gracious, unaffected personality. The dining room exudes a authentic warmth that could only seem genuine in rural America with its knotty pine walls and high ceilings, as well as an antique piano in the back. Art work by local artists line the walls and occasional live music also takes place in the quaint space. The menu — with virtually all the food made from scratch — showcases salads, small plates, appetizers, pizza, pasta, daily specials and homemade desserts. The pasta with sausage in vodka sauce is to die for, as well as the light, flavorful Margherita pizza with a fresh sauce of pomodoro tomatoes, mozzarella, freshly torn basil, and a touch of oregano. The meals at UXLocale are simple and based on rural Italian cuisine, meaning there is an abundance of pizza and pasta dishes on the menu. The use of fresh vegetables, greens and eggs from local farms adds to the appeal. Additionally, desserts come from a local, sweets specialty shop. What was surprising was the short but impressive wine and beer lists. We ordered a robust red Italian wine that went well with nearly everything on the menu. All pizzas are judged by the crust and the crust at UXLocale is spot on. Thin, crispy, slightly burnt on one side and surprisingly light, the two pieces did not sit like stones in my tummy. Add fresh, local vegetables and cheeses and you have a masterpiece. With its successful beginnings, and growing popularity, UXLocale is destined to be a favorite. Uxbridge, MA has had a new place to cool off since UXLocale opened to serve ice cream earlier this month. And, since recently being approved for its liquor license, UXLocale is expected to become be a new culinary destination harnessing local resources in a rustic setting. If the work Founder and Chef Elaine Pusateri Cowan and her large family have put into readying UXLocale is any indication, the Blackstone Valley’s newest culinary destination is going to be a success. As David Kmetz points out in a press release he prepared for her, Chef Elaine and a large contingent of relatives—“moms, uncles, aunts, all pushing 80 I might add, brothers, sisters, nieces, nephews, friends and colleagues” have “all pitched in” for months of intense designing, building, refurbishing and painting to get “spiffy yet rustic digs” atop West Hartford Avenue in shape for a grand opening in the next few weeks. Chef Elaine’s husband Charles Cowan III, her son Charles IV and daughter Antonia have been mainstays in preparing UXLocale for its unveiling. The ice-cream window is already open. Asked about her background on July 14th, while continuing renovations that have included a “scrubbing of everything from ceiling to floor,” the creation of countertops and “a lovely terrace that overlooks fields and farms,” she said “I’m a social worker-turned-educator-turned…” well, restaurateur! Elaine T. Cowan is chef/owner of The UXLocale, a restaurant in Uxbridge that has garnered a lot of attention since its opening last fall. “It’s been a dream of mine for a while,” said Cowan about her first restaurant. The owner and chef de cuisine said the business is a “perfect fit” for her, and she’s “extremely happy and fortunate” that she is able to do something she loves to do. Cowan previously worked at the Worcester Center for Crafts and the Worcester Art Museum for 15 years. She was a chef at the Specialty Sandwich Bar & Grille in Holden and owned Elaine’s Epicurean Enterprises. 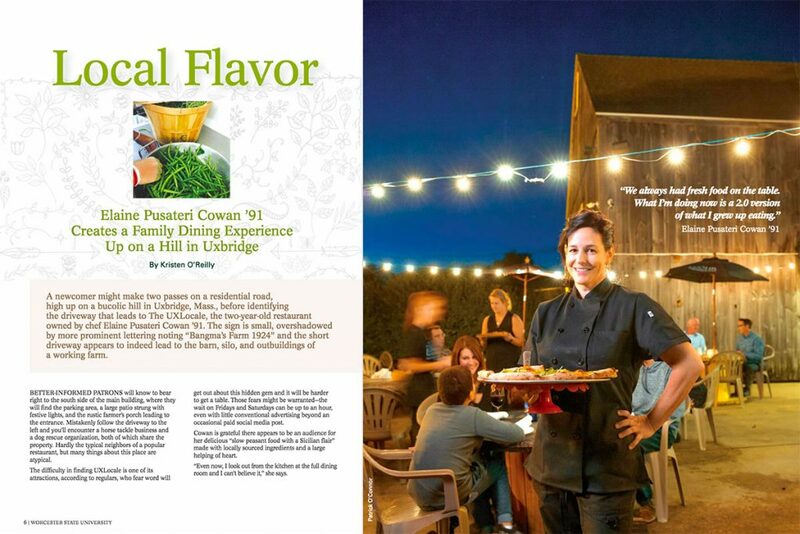 She is a regular contributor to Foodies of New England magazine. Cowan also is a community advocate and volunteer, and is a member of several community advisory boards.